This book has been lovingly compiled by popular demand from parents and children, after the author shared her love for the Prophets series on social media. To help your children have a good Islamic upbringing it is important to teach your children about the history of Islam and to develop an understanding and a love for not just the Prophet Mohammed (saw) but the other Prophets as well. As a child I was never taught about all the different prophets and if I am honest I never really ‘clicked’ and was Muslim just because I was told that I was and was pretty much indifferent to everything. 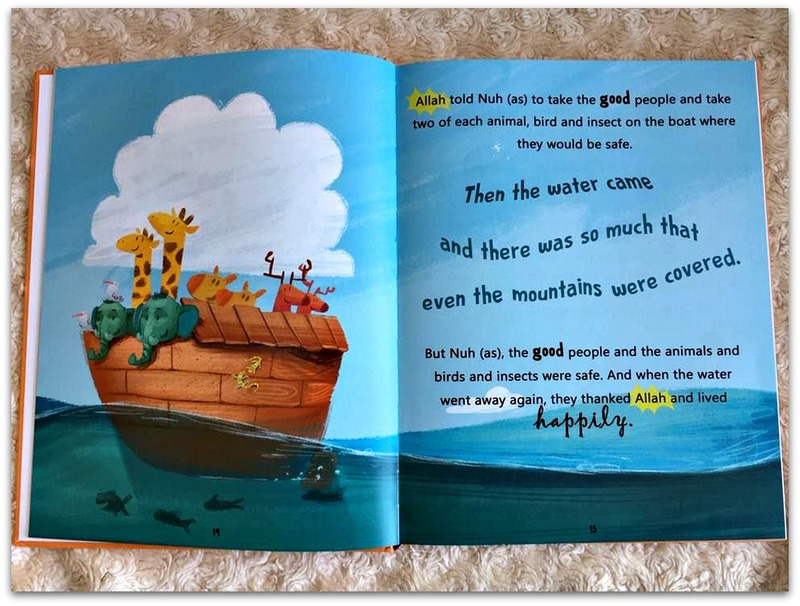 That is why I am now grateful that good quality children’s Islamic books are making an appearance…and this is one of them! Firstly what I love about the book is that is has been reviewed and approved by scholars; which instills a confidence that what we are reading and teaching our children is correct and beneficial. The stories are simplified and the language used is perfect for the little ones to be able to understand. The whole book is illustrated beautifully with vibrant pictures which the children will love. What is important is that there are no depictions of any of the prophets or sahaba in it. What is unique to the book is the ‘Question Time’ at the end of each story. Rather than the traditional list of questions and asking the children to answer them, the question time is a dialogue between Migo and Ali. 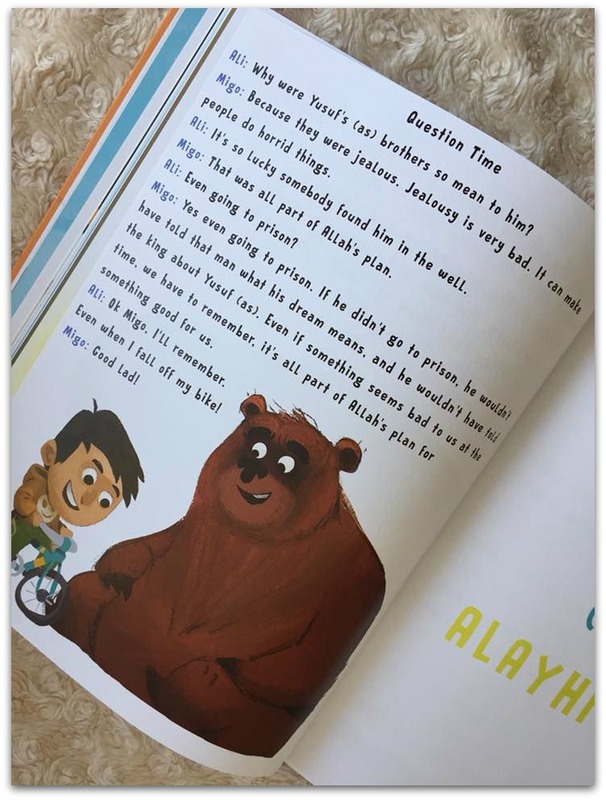 Migo and Ali discuss what they have learnt and ask some questions that your child may also have after reading the story. The book is a firm favourite with myself and the girls also seem to be enjoying it. A must have in every Muslim Household! Watch the video below to learn a bit more about the book. Disclosure: I was sent the book by Mini Muslim Playground as their brand ambassador. However I wasn’t asked to do a specific review on it, all thoughts and opinions are our own. I like the look of the book, especially the font. It looks nice and colourful. Your review gives a good idea of what it’s about. My favourite part is the question and answer, that sets the book apart and I think also makes it non-preachy. My daughter loves to learn the stories of the Prophets. We have a Bedtime Qur’an Stories book that tells the stories of the Prophets. This book may have to join our library! SubhanAllah this is so cute and essential! This is so cute, love reading and I love the idea of getting children pumped for reading. Thanks for sharing. Thanks for sharing. history could be taught more easily with stories. It looks a great storybook. 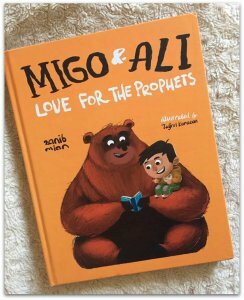 That’s an awesome book….My mom is here and she always tell bedtime stories of prophets to my lil one and she loves hearing them again and again….illustrations make this book more interesting for the kids to read….